International Visitors right across our Capricorn region and greater Southern Great Barrier Reef destination have continued to grow over the past few years, with one of the highest regional percentage growth rates in Queensland. Whilst international numbers from our key western markets continue to grow to Australia and Queensland, convincing visitors to include our destination in their itinerary (which is often pre-determined and pre-booked), is much harder to achieve, against larger and more established tourism destinations, but we are succeeding thanks to partnerships, collaboration and determination! This has not happened by chance. Capricorn Enterprise in partnership with our regional tourism organisations in Gladstone/1770 and Bundaberg have worked extremely closely under the greater Southern Great Barrier Reef destination brand for the past nine (9) years. We have managed to stretch limited funds to succeed in marketing efforts (consumer and trade), not previously seen in the international arena by our region, ever before. Here is just a snapshot of some major milestones in our target international market in Europe. In 2013, we hosted Tourism and Events Queensland International Director Kai Osterman to Great Keppel Island, Heron Island and Lady Elliot Island. Kai instantly saw the untapped potential of our Southern Great Barrier Reef Destination. At that time, we had less than 15 operators across the SGBR who were actively working in tourism trade distribution, which grew to some 60 SGBR trade ready products just five years later to 2018, thanks to an intense annual Tourism Trade Mentoring program. Capricorn Enterprise Tourism Marketing Manager Deanne Bowd representing SGBR, participated in our destination‘s first ever Qld on Tour Europe in December 2014. This roadshow increased the awareness of SGBR, grew business opportunities for our trade ready product and strengthened and established our relations with product and sales managers across Europe. The opportunity for our SGBR Destination to be exposed to agents in Hamburg, Zurick, Stuttgart, Amsterdam, Salzburg and London was a key turning point for us and otherwise impossible without strong partnership and collaboration. Pre and Post the annual Australian Tourism Exchange (ATE) in May 2016 was another major turning point with TEQ Europe Market Development and PR Manager Annette Kegel visiting the SGBR for the very first time (visiting Carnarvon Gorge, Rockhampton and the Town of 1770). This visit was followed by Market Development Manager Adriana Fischer visiting Yeppoon/Capricorn Coast and Great Keppel Island. Also in 2016, TEQ Europe host Peter Mierzwiak visited our SGBR destination with seven (7) international media to Carnarvon Gorge, the Capricorn Coast and Great Keppel Island, accompanied by Capricorn Enterprise Tourism Marketing Manager. This familiarisation visit was over a year in the planning and was financially supported by Capricorn Enterprise ($10,000) and thanks to our incredible partnersip with TEQ Europe. The PR results of this major media famil included eight (8) published stories with a circulation of 3,751,000 readers and a publicity value of $831,000. In January 2017, SGBR again participated in Qld on Tour Europe to build on the business relationships already formed. Then in December 2017, our Tourism Marketing Manager attended our first ever SGBR solo visit to Germany, as our SGBR destination was invited as one of only two Queensland destinations (with Australia’s Natures Coast) to attend the Best of Travel Group (BOTG) agent training in Dusseldorf. To utilise this international visit to the best of our resources and budget, the SGBR Destination subsidised the visit to include fourteen (14) of our trade ready products in a very targeted sales mission. This sales mission across Dusselforf, Frankfurt and Munich included presentations to BOTG, Explorer Fernreisen, Boomerang Reisen, Dertour, TEQ Europe, Tourism Australia, Pacific Travel House, Kiwi Tours, Studiosus and STA Travel. Many of our trade ready operators are now contracted with a number of international wholesalers, particularly three of the five major German wholesalers – BOTG, Explorer Fernreisen and Boomerang Reisen. The collaborative efforts of our three SGBR RTO’s working with our Trade Ready contractor Amanda Kruse (Success Matrix) and SGBR operators here in Queensland, combined with the team at TEQ Europe is the strength in numbers that we need to continue growing our destination. During 2017, we hosted yet another German Wholesaler, German Diethei via Australia Tours, after our SGBR inclusion in their campaign. Our SGBR destination also enjoyed a double page spread in the most recent Boomerang Reeisen/TUI Business to Business brochure. 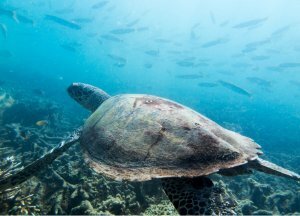 The most recent evolution of our partnership has been thanks to TEQ Europe working with seven (7) of Queensland’s RTO’s along the Great Barrier Reef to collaborate our resources to commit $125,000 during 2018/19 and again in 2019/2020. This has been matched by TEQ Europe dollar for dollar ($125,000) in order to leverage Tourism Australia and trade partners to combine resources into a major annual campaign to the value of $300,000 to promote the Great Barrier Reef and our individual destinational precincts/products over two consecutive years. This collaboration, led largely by the teams at TEQ Europe and Tourism Tropical North Queensland (TTNQ) is criticial to the success of Queensland and all of our destinations. Consistent growth in international visitors doesn’t just happen – alot of work goes on behind the scenes with our tourism operators, trade partners, regional, state and national tourism bodies.